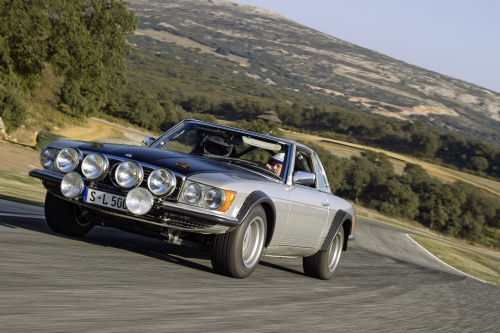 Everybody, who is a bit familiar with the Mercedes SL rally activities, knows that Daimler-Benz had used just two street-going SL cars for works-supported races: the 300SL W198 and the 230SL W113. And that was it. Well…was it really? 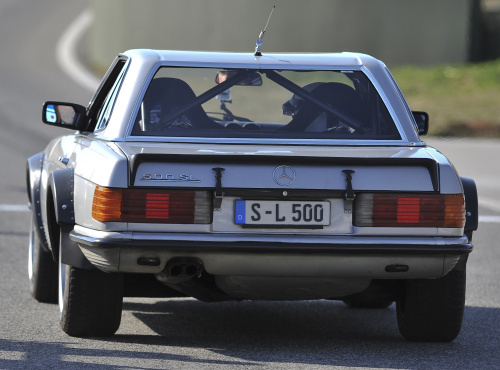 What happened to the Mercedes R107 SL? Yes, it was used as a rally car, but then…it wasn’t. Ok, before I confuse you completely, let me tell you the story of the (almost) forgotten SL rally car. 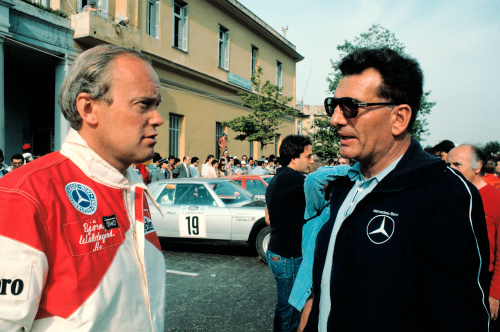 At the end of the 1970s Daimler-Benz participated under the leadership of Erich Waxenberger at various world rally championship events. 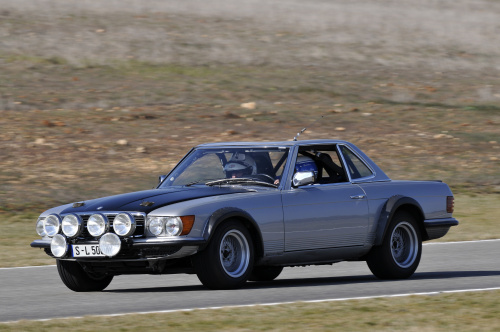 The car they used in 1978, 1979 in group 4 was the 450SLC 5.0 C107. 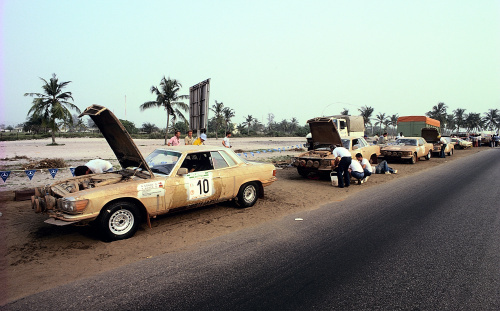 In 1980 the car was slightly updated with black wheel-arch extensions and used for the group 2 rally events as 500SLC in Argentina, New Zealand and the African Ivory Coast Bandama rally. Erich Waxenberger (right) with rally-driver Björn Waldegaard at the 27. International Rallye Akropolis, 26.- 29. May 1980. The car had initially 305 hp and although this was later upgraded to 329 hp, the big coupe was too heavy and too long for such kind of activities. A lighter alternative was needed. In comes for the 1981 world rally series the Mercedes R107 500SL. Waxenberger had the car fitted with an aluminum roll-over cage and replaced some of the metal undercarriage panels with thinner ones, normally used in sedans. The roof was not welded, but bolted on with seven screws. All glass area except the windshield was replaced with polycarbonate material. The windshield could not be replaced as it was bonded to the frame and needed for the car’s overall stiffness. 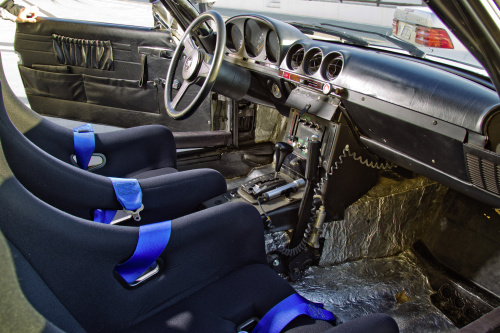 Much of the interior was changed too, the driver’s Recaro plastic seat weighted just 4kg (8,8 lbs). At the end the new Mercedes R107 rally car was with 1,350 kg (2,976 lbs) some 236 kg (520 lbs) lighter than the 500SLC. On the internet and in some publications one can read that the SL had 340 hp, even 380 hp, but documents from Daimler-Benz do not support this. But as a novelty it had a four-speed automatic gear box that could be shifted manually. Most of the time just 3rd and 4th gear was needed. As high top speeds were not of such an importance, the car was fitted with a shorter final drive ratio of 1:4,08. This resulted in an acceleration from 0 to 100 km/h of 5,9 seconds and a top speed of 220 km/h (137 mph). Four cars were prepared and the only thing that was needed now was an experienced driver to handle the beast, which was first used at the 1980 Bandama rally as test car. So it came quite handy that Bavarian Walter Röhrl had just won with co-driver Christian Geistdörfer for Fiat on a 131 Abarth the 1980 WRC. 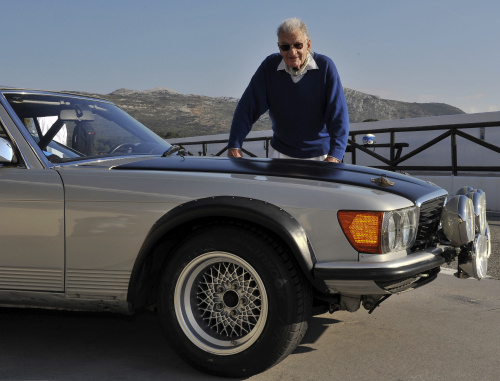 Equipped with a ten-year contract he immediately started to test the car for its potential to win the 1981 world rally championship for Daimler-Benz. Compared with the Abarth Fiat the Mercedes R107 500SL was far heavier, it was also noisier and with its limited-slip differential (80% locking rate) and a revised parking brake with an upright lever it could excite spectators not only with its sound but especially with spectacular drift angles. Those drifts were needed, as the big V8 engine made the car fairly front heavy. The driver had to swing the car around before entering a curve, otherwise the beast would have continued going straight, no matter in what direction the front wheels pointed. But nothing to worry about here, Walter Röhrl was just the man to handle it. Daimler-Benz engineers knew of this slight handicap of course and had already drawn sketches how to switch the car to a mid-engine lay-out. 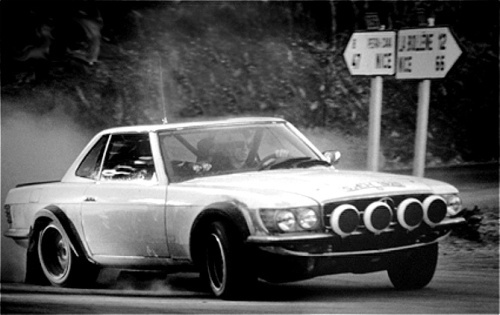 In December 1980, Waxenberger had just returned from the Bandama rally (his two 500SLC had finished 1st and 2nd place), the executive board was to decide in their board meeting on the funding for the 1981 rally season and beyond. Waxenberger, who was invited to present his case, promised to deliver Daimler-Benz the World Rally Championship in time for the 100th anniversary of the automobile in 1986. There was one small problem though, prior to this meeting a slightly skeptical board member had asked Walter Röhrl, whether it would be possible NOT to win the January 1981 Rally Monte Carlo. Neither Röhrl nor Waxenberger had plans to dominate the rally circus with the new car from the very beginning, so a cautious Röhrl answered that he expects to finish among the first five. Ooops, that of course was not, what that board member wanted to hear and consequently the board (which had been informed of Röhrl’s answer) did not really trust in this crucial meeting Waxenberger’s promise. After much debate they finally agreed to fund the racing activities with one instead of two cars. Naturally that was not, what Waxenberger needed. After all, he had four cars and with Walter Röhrl and Ari Vatanen two world class drivers. So he told a somewhat stunned board that if he would not get the funding for two cars approved, he would prefer to stop all racing activities instead. Having said that, he stood up and walked out of the room. Of course he expected the board to cave into his demands and call him back. He had heard that former head of design Karl Wilfert had done such moves fairly frequently. That way for example, Wilfert got the pagoda roof of the W113 approved. Problem was, Wilfert had always played his moves very carefully and had made sure that he had at least one or two board memebers prior to such a scenario on his side. Waxenberger had no one supporting his stand. Case closed. Suddenly the reigning world champion Röhrl, his co-driver Geistdörfer and their Finnish colleague Vatanen were out of a job. How is that for a Christmas present. As abrupt as it might seem to the outside world, Röhrl’s honest answer and Waxenberger’s threat might not have been the only reason for the board to cancel the rally project. 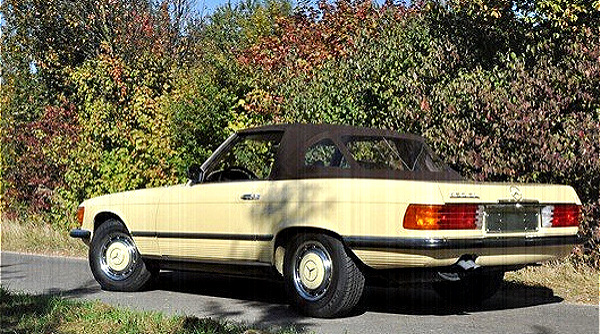 It was rumored that Daimler-Benz had a budget for a single rally (using the SLC and the 280E W123) that other car manufacturers had for the entire rally season. In those days Mercedes cars were selling at a very healthy pace with customers complaining about long waiting lists. There was no reason to throw a big amount of cash on an exercise that was not guaranteeing the company a first class finish. It was with some justification feared that a less than stellar performance could even have a detrimental effect on overall Mercedes car sales, as the iconic image could suffer from a rally defeat. From today’s point of view and also looking at the recent somewhat mediocre Formula One performance of Mercedes, such thoughts might look a bit bizarre. But back in those days with the “über-image” the company enjoyed, any threat of running only in second or, heaven may forbid, even in third place was unacceptable for a proud Mercedes manager. This was compounded by the fact that the competition was not at eye’s level with Daimler-Benz in the view of the public. The competition was not anymore like in the 1950s Ferrari and Jaguar. No, the competition was of all companies Fiat and Opel. How can an Opel beat a Mercedes! Can someone please explain to the Daimler-Benz board (and the public), why last weekend a mid-size Opel Ascona managed to win the rally with a similar-sized (and equally cheap) Fiat 131 coming in second. 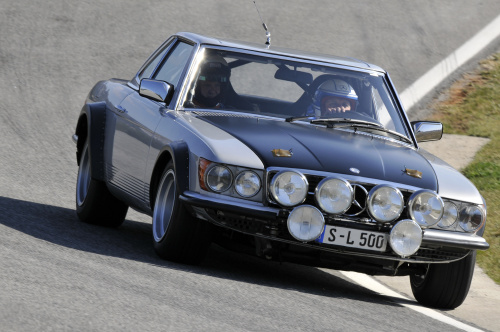 And oh yes, the mighty (and expensive) 500SL came in third. Although that’s even better than to be among the first five that Röhrl had predicted. It must have been a nightmare for every Mercedes technician (and salesman) and the press sure would have had a field day to come up with headlines in big bold letters that read: Fiat and Opel better than Mercedes. No wonder, Daimler-Benz threw so much money at each race. Once they had decided that racing was good for image and sales, they had to make bloody sure that they would win. Anything else was an absolute No Go. This was the case with the big and heavy 300SEL in 1970/71. Once the tire problems became so severe that they threatened a first class performance, the board (Hans Scherenberg) threw in the towel. And this is the case again with the 500SL in 1980/81. And here comes the reigning wold champion and tells them that all their big money would not guarantee a rally success? The half-hearted attempt by the board to grant Waxenberger the money for just one car was already the sign on the wall that he had not presented his case convincingly enough. All they needed now was a somewhat graceful way to get out of it. Now they could blame Waxenberger for not accepting their offer. And “Waxl” must have shot himself a few times in the foot not to have played his cards a bit more carefully. And if you are interested to read, how this truly fascinating story continues and whether or how many of the original cars survived, here are the links to my R107 e-book and the printed book. The printed version deals with all modern SL cars, from the R107 to the R231. And what about C123 280CE? This one is really forgotten….I guess the only one that survived is now owned by H.J.Wetter, but after reconstruction it’s slightly different than the original one in 1980. There is no documentation, most pictures are showing this car AFTER reconstruction… Do you have any informations about this car?? That’s a very interesting project you got yourself, and a very demanding one I guess. I wish you all the best with it!! I’d love to see pictures of the car, once it’s done. falls Sie Interesse haben, kann ich Ihnen die 3 original Rallye Fahrzeuge zeigen, die 1982 mit weiteren Fahrzeugen und Tonnen von Equipment an die Firma GVB-Greschbach verkauft wurden. Alle Fahrzeuge und Teile wurden von Waiblingen damals nach Kenzingen transportiert. Seit diesen Tagen stehen diese Fahrzeuge bei mir in Kenzingen. Ich spreche von den für W. Röhrl aufgebauten 500SL’s und dem A. Vatanen 500SLC. Ich möchte Sie aber bitten, diesen Kontakt vorerst aber vertraulich zu behandeln. ich habe Ihnen gerade eine private email geschickt. ich bin auf der Suche nach einem dieser Fahrzeuge, genauer gesagt nach dem Röhrl Sl Baujahr 1980. Das Interesse liegt daran, weil ich entweder diesen SL privat nachbauen wöllen würde und technische Daten benötige, welche sich leider nirgendwo im Internet finden lassen, oder ihn käuflich erwerben wollen würde. What a wonderfull car! Its very impressive and the curves are espectacular. I need as much info as i can get on the 450slc rally car of Stig Blomqvist that rallied in 1979 East African Safari and the 1979 Bandana Rally in the Ivory coast. At taht stage i worked for Mercedes in South Africa, and was on the two rallies. I live in South Africa and am building a replica of one. There is already a very nice replica in South Africa, based on Stiq’s Bandana version.